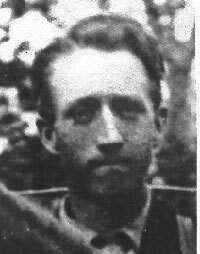 Mark Minion Leavitt was born June 27, 1886 at Farmington, Utah, the youngest son of John Quincy Leavitt and Cynthia Tryphenia Elmer Leavitt. His early boyhood was spent in Farmington and West Weber, his father was President of the railroad at that time. Mark started his schooling at West Weber going there until he had completed the seventh grade. The family then moved to North Garland in Box Elder County. That fall he completed his eighth grade. During the winter months he would attend school in Salt Lake coming home to work in the summer. Mark met his bride to be, Alice Dalton in November at a dinner party, given at the home of Mary Bowen, and from that evening on they were sweethearts. Their marriage took place on the 26th of June 1907, one day before his 21st birthday. They traveled to Salt Lake City by train and spent the night of June 25th with Mark's sister, Ida Leavitt Hatch. They were married for time and all eternity in the Salt Lake Temple by John R. Winder. George Romney and D. W. Rives acted as witnesses. Mark and Alice made their home in North Garland. It was here at the old family home that their first child was born, Minion ValGean Leavitt. When Gean was two years old the family rented a home from a druggist, Mr. Rite. They then moved to Garland. At this time their second child was born at Fielding, Utah; a boy, Frank LeRay Leavitt. Mark was now working in the butcher shop, but seemed it was time for another venture so he rented the old Garland Hotel, then known as the Lawson Hotel. This he managed for two years. For many years while living in Garland area Mark drove the Hearse. In those days a black or grey team was the custom. Baseball and all kinds of sports were a part of his life. He raised and broke horses being a fine horseman. He and several other men bought a Percheron stallion and he cared for and stood this horse Carmire for several years. Mark and his brother Julian Leavitt bought a Hamiltonion horse by the name of Harimon, they race him at the old Lagoon track and later sold him for a good profit. They moved back to North Garland and Mark went to Wyoming to work for Austin Bros. Livestock Co. He took a fine Hamiltonian Stallion with him and sold him there. Their third child, a son Horace Thales Leavitt was born at the old home in North Garland. When Mark returned after a year in Wyoming the family moved to a place called “Thirteen” west of Tremonton, Utah. Here Mark took care of the cattle for Patterson Livestock Co. in the winter feeding, and in the summer putting up the wild hay. The next move was to "Salt Creek" where Mark took over the farming of 120 acres of irrigated land for the same company, as well as breaking draft horses for them. He did this for two years. It was at the home of Alice's parents that their fourth child was born. A daughter being given the name of Alice Cynthia Leavitt. In the fall of 1920 the family moved to Blue Creek where they purchased a dry farm from a Mr. Samuelson. The third year Mark took on the job of County road supervisor. It was horse drawn graders and dump board gravel wagons. About this time most of the main road to Blue Creek and on to Snowville was taken over by the State Highway Dept. which involved larger graders from the four horse drawn to a twelve horse drawn. Mark then took over the management of the M. &. L. ranch in Blue Creek. He employed two men year round and four to twelve summer and fall. His food wife, Alice, cooking and caring for all these people besides her own family. His interest in horses and his dealing in them never stopped. For several years horse buyers from California and Oregon came and he supplied them with fine horses. He managed the Saturday night dances at Howell for many years. He was involved in the promotion of the 4th of July and 24th of July celebration. He taught his boys to fish, hunt and to do all things that young men enjoy. He enjoyed and loved his small daughter, He was a strict man, a good teacher, a fine horseman and a good friend; having friends from Cache Valley to the Nevada line. He was a good neighbor and a sponsor for all civic activities. His life was ended at the early age of 41. He was killed in an automobile accident February 3, 1927. About one half mile east of the Heb Stohl ranch on the road to Blue Creek. He was buried in the Fielding Cemetery.